I adore the miniature world and all the lovely, giving miniaturists out there. 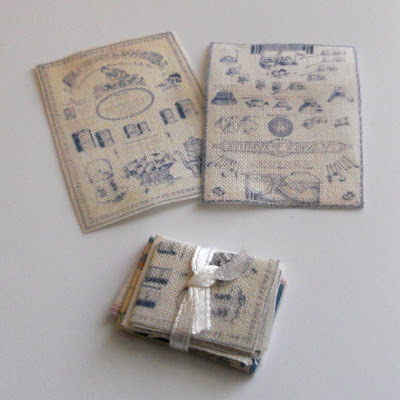 Some time ago Norma had a blog contest for some wonderful minis that I was only too happy to enter, yet when she discovered my name was not in the hat after she pulled the names, she was kind enough to send me a wonderful gift of the lovely handmade miniature french tea towels pictured below. Sorry for this tardy thank you, Norma. It was very thoughtless of me, but please know that I adore the gift and already have an idea as to where it will go in one of my miniature displays. There are no people kinder than those that have a love of the tiny and the small!! Hi Diane! Norma's towels are so pretty and special. They have an old world look about them. I love Norma's work! Hi Lucille. Thanks for stopping by!